Earlier this year FFF stayed at The Greenwich Hotel in New York, and we couldn’t get enough of the food from the hotel’s restaurant Locanda Verde. Think fabulous urban Italian that wraps you up in its delicious arms and comforts you with simple yet outrageously good flavours. Karen DeMasco, head pastry chef at Locanda Verde, continued this theme with some of the best breads, cakes and cookies we’ve managed to get our mits on. In fact, her baking is so good we could not leave town without her cookbook The Craft of Baking so we could indulge at whim in our own kitchens. 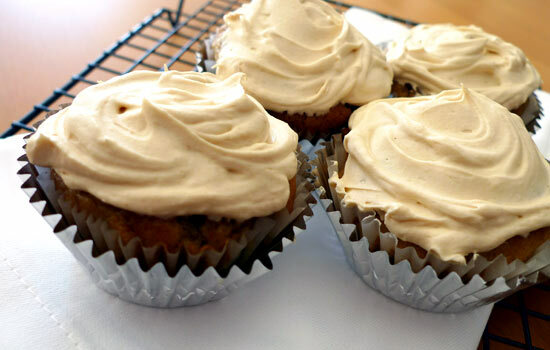 These Banana Cupcakes with Peanut Butter Frosting are a perfect example of Karen’s whisk wielding genius and quite frankly defy description. So if you want to know what they taste like, make this your FFF DIY project for the weekend… and shout yourself a copy of Karen’s bible of a baking book for your library!